PRODUCT DESCRIPTION: Mold Buster Advanced Mildewcide and Moss preventer can be added to interior and exterior coatings when additional protection is required to control surface mold, mildew, moss and algae growth on surfaces both inside and outside the home. 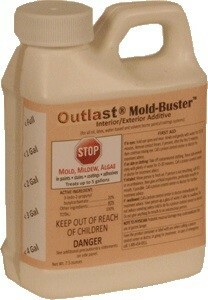 Mold Buster will not hurt the environment and is non-toxic. It does not contribute to the odor or VOC of paint. Mold Buster is recommended for use in coatings applied in high humidity environments and for applications where mildew or moss has been a problem in the past. DO NOT treat over existing mold, mildew or algae. Always sanitize the substrate and clean thoroughly before treating with Mold Buster. When used on properly prepared wood, treatments can inhibit mold growth for 2-3 years. WHERE TO USE IT: Exterior and interior paints, stains and other cement or vinyl treatments and surfaces. RATE OF APPLICATION: 1.5 oz per gallon of paint or stain; the 7.5 oz jar is enough for 5 gallons of paint or stain, oil or water base. Mold Buster can also be sprayed on wood using 2 oz per gallon of water per 500 feet of surface area.